Garnet rondelle gemstones and sterling silver beads are featured in this birthstone bracelet, In the center is a Capricorn sterling silver slider charm which has "Capricorn" on one side and a picture of a Capricorn on the other side. The bracelet is 7.5" in length with a sterling silver and garnet box clasp. Garnet is known as the stone of romantic love. 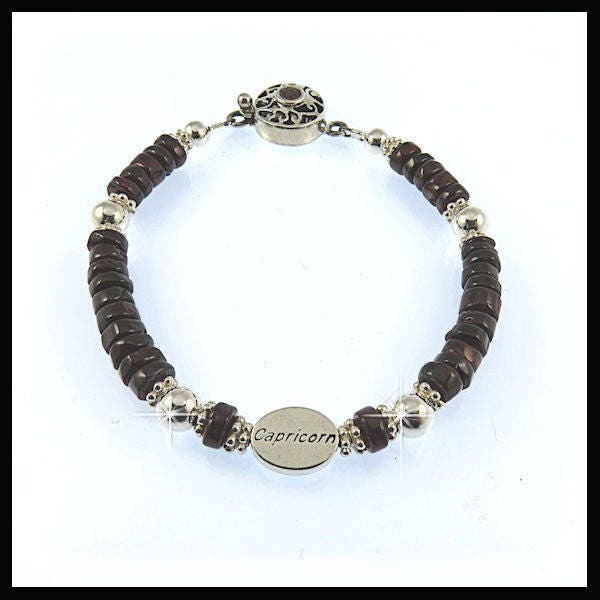 Garnet connects to the heart and base chakras, grounding emotions. Exquisit! If I could, I would give more stars! Many thanks also for the little gifts and for speedy delivery despite the bad weather! What a BEAUTIFUL piece...I LOVE IT! VERY Fast and Secure Packaging....and a couple of gifts...much appreciated! Thank you...will order again from this designer.